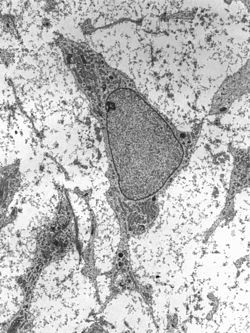 Transmission electron micrograph o an adult stem cell displayin teepical ultrastructural characteristics. Stem cells are undifferentiatit biological cells that can differentiate intae specialized cells an can divide (throu mitosis) tae produce mair stem cells. This page wis last eeditit on 15 September 2018, at 17:53.